Hi! 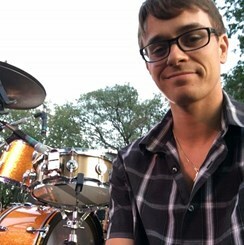 My name is Ryan Carver and I am a drum teacher at the Toms River location. Im obbsessed with playing the drums and I made it my career. Not only has Ryan been teaching for almost 20 years, he is also the Drumline Technician for The Toms River High School South Marching Indians. Ryan can be seen performing performing each week performing throughout the tri-state area with eading Rock and country artists. Ryan combines over 16 years of teaching and performing experience into his lessons providing each student the ability to build focus and confidence while learning to play music in any genre. wheter you'r looking to just have fun, be beter in your school band, or takingn your own band to the next level, Ryan will provide you with the tools neccessary to accomplish you goals! Ryan is the owner of Carver Drums Custom Drum Company and endorsed by Vic firth Drumsticks, The Sweet Spots Drum Dampners and Onboard Research. Request Lessons with Ryan Carver today!